Thanks to our partnership with FedEx, GI Pathology offers next-day turnaround time for patients awaiting biopsy results. Located in Memphis, Tennessee, GI Pathology is located just minutes from the central hub for FedEx. Our highly trained laboratory professionals and our dedicated logistics team work though the night to ensure patient biopsies are processed and delivered to our expert GI pathologists. GI Pathology has the world’s only gastrointestinal pathology fellowship program dedicated exclusively to patients undergoing outpatient endoscopy procedures. Upon completion of this rigorous fellowship program, each pathologist will have reviewed more than 10,000 biopsies before becoming a member of our pathology staff. And, a few short years after that, they will have diagnosed more challenging gastrointestinal cases than the typical pathologist reviews in decades. Microwave Processing: GI Pathology employs a proprietary microwave-processing technique, which speeds sample fixation, one of the most time-consuming steps in histology. GI-Specific Fixative: GI Pathology uses a zinc-buffered formalin solution for specimen transport, which enhances morphologic interpretation of gastrointestinal tissue. Special Stains: Our pathologists rely on the gold standard for special stains: Warthin-Starry for H. pylori detection and a combination Alcian Blue/Periodic Acid Schiff (AB/PAS) for esophageal biopsies. We will not compromise quality by using less expensive, less reliable stains in their place. Services are offered for the detection of the most common bacteria, viral and parasitic pathogens in patients with symptoms of infectious colitis or gastroenteritis. This testing is performed using the Luminex xTAG assay and a novel patient collection kit that allows for sample collection and shipment directly from the patient’s home. In the case of lymphomas and other significant conditions, GI Pathology has access to a specialized team of experts in hematopathology through OncoMetrix. The team at OncoMetrix has the latest in technology to quickly and accurately provide expert consultation in these unique and critical patient cases. 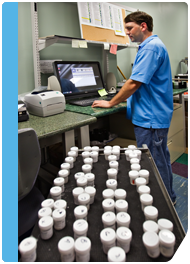 GI Pathology’s core business is centered on routine histologic diagnosis of tissue biopsies. Our laboratory has analyzed more than one million histology cases to date and routinely analyzes more than 1,000 cases per day. We are equipped with the latest technology and processes including special stains for H. pylori, Barrett’s esophagus and other gastroenterologic diseases and disorders. A comprehensive menu of immunohistochemical (IHC) markers and special stains are offered. These include such important stains as H. pylori and HER2 for gastric cancers. Stool cultures and sensitivities are available upon request. We also offer other rapid microbiology tests that can be performed on stool specimens including c. difficile testing. Please contact client service to learn more information about our microbiology offering and to acquire the appropriate collection kits.